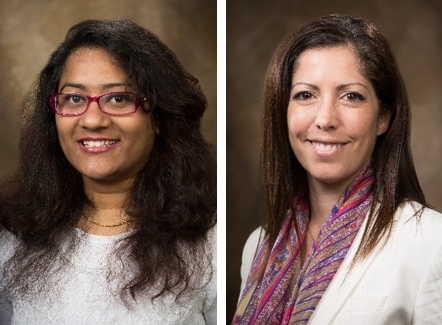 Two civil engineering graduate students, Taslima Akter and Magdalene Asborno, both advised by Sarah Hernandez, were recently awarded top honors in from the Missouri Valley Section Institute of Transportation Engineers. The Missouri Valley Section of the Institute of Transportation Engineers, also known as MOVITE, covers the states of Nebraska, Iowa, Kansas, Missouri, Oklahoma, and Arkansas. MOVITE includes traffic and transportation professionals representing public agencies, academic institutions, private industry and consulting. Akter won first place in the 2018 Thomas J. Seburn Student Paper Competition from MOVITE. This year, the evaluation committee selected her paper, "Leveraging open-source GIS tools to determine freight activity patterns from anonymous GPS data," as the most significant contribution to transportation engineering, earning her a prize of $1,500. The award will be presented at the 2018 fall MOVITE meeting in Lenexa, Kansas Oct. 3-5. Akter will attend the meeting and present her paper. Akter also recently won the 2018 GIS for Transportation Symposium's Best Student Paper Award from the American Association of State Highway Transportation Officials. Asborno's paper, "Using State Travel Demand Data for Transload Facility Location Planning," took second place at the 2018 Thomas J. Seburn Student Paper Competition at MOVITE. Her paper was presented at the 2018 Transportation Research Board's annual meeting in Washington, D.C. The paper is based on a research project carried out by a multidisciplinary team at the University of Arkansas and titled "Locating Transload Facilities to Ease Highway Congestion and Safeguard the Environment." The evaluation team selected her paper as a significant contribution to transportation engineering based on originality, significance, scope, validity and applicability. MOVITE also awarded Asborno the 2018 Jan Kibbe Student Scholarship. The evaluation team awards this scholarship annually. Magdalena's selection is based on her proposed program of study, career objectives and recommendations. Micah Hale, head of the Department of Civil Engineering, praised the accomplishments of both students. "The Department of Civil Engineering is very proud of Ms. Asborno and Ms. Akter," Hale said. "Receiving these awards speaks highly of them and their research topics as well as Dr. Sarah Hernandez's research program."